I have to confess that I’ve never seen a production of Love’ s Labour’s Lost that I’ve wholly enjoyed. Until now. One of director Andrew Hilton’s strengths has always been his meticulous attention to language, and it pays dividends here in a production that has all the formality of an old-fashioned dance and all the soppy playfulness of first love. Lines that fell to the ground with a dull thud in other productions, here dance off the characters’ tongues. So much so that when Berowne berates his fellow lords for their foolish lovesickness, the audience gives him a round of applause as if he was a skater who had just performed a particularly daring feat. The rest of the cast rise to the occasion too. It is undoubtedly the case that this unsubsidised Bristol outfit offers the most consistent and enjoyable programme of Shakespeare in the country. The Sunday Times Andrew Hilton’s enchanting production takes place on a completely bare stage. For part of the second half, the actors are treated for a while to three park benches and a garden chair. This means there is nothing for them to fidget with or lean on except acting; and in this sweet, autumnal comedy of style, language and manners, full of taffeta phrases, silken terms precise, this is a real challenge … The ending, suddenly dark and moving, doesn’t always work as it should. Here it does. The Stage … a delightful and at the end bitter-sweet, telling of how a king and his three courtiers, intent on casting aside earthly pleasures, are defeated in the game of love by four enchanting young women. 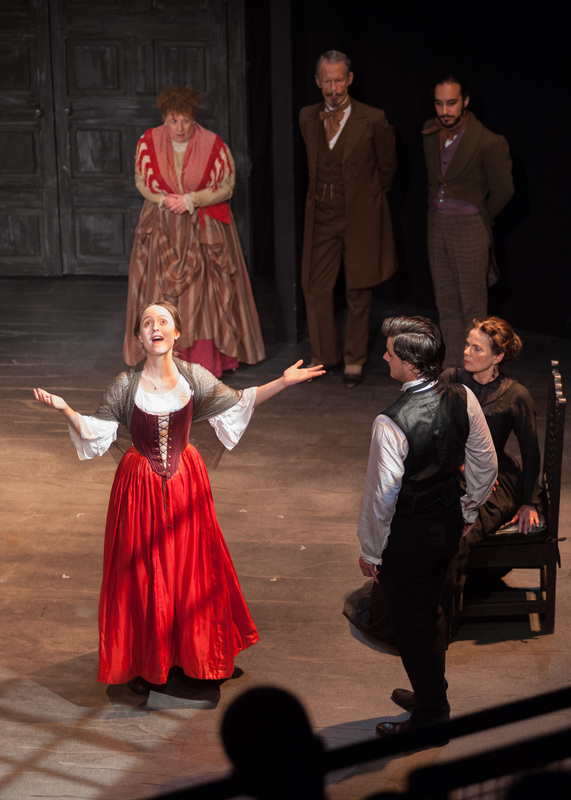 The production is particularly adept at uniting those much-repeated Shakespearean themes of high jinks at court and low comedy in the country. Here there is a bravura performance from Matthew Thomas as a worldly yet smitten Berowne, surely the prototype for that later sophisticate Benedict, matched by Lucy Black’s mischievous Rosaline and contrasted by the more regal approach of Jonathan Gunning (King of Navarre) and Saskia Portway (Princess of France). Unusually, the rustics also capture the mood of sophisticated verbal wit and speak the verse with as much authority as anyone, with Roland Oliver’s schoolmaster Holofernes anything but the dull pedant he sometimes appears to be and Tom Sherman a knowing clown of a Costard. The one real outsider, the fantastical Spaniard Don Adriano de Armado, is played mainly as a figure of fun by Paul Currier, but he too becomes almost a tragic-comical figure at the compelling end. Love’s Labour’s Lost is the miracle child of an unlikely marriage between literary artifice and sheer theatrical know-how and instinct. It is enormously difficult to read – linguistically and grammatically dense, crammed with sophisticated flights of Elizabethan fancy and bawdy double entendres, and framed in complex rhyming schemes that frustrate many a well-meaning attempt to ‘tweak’ the language to the modern ear. But immediately it is given to actors to command, it shows what a shrewd master of comedy Shakespeare was. Though elsewhere he pursues the complex plotting he and his contemporaries learnt from Plautus – think of Twelfth Night or The Comedy of Errors – here he has the confidence to weave a world of experience into the very simplest of designs. Four young men, rashly vowed to learning and self-denial, meet four young women and attempt to woo them. With minor elaborations, and the background canvas of a rural community, that is the plot. 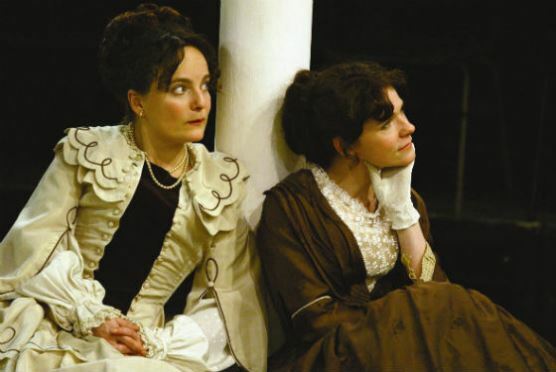 Within it we get a comedy of sexual politics that can with ease shift forward nearly three hundred years and still illuminate the eternal debate between male and female. And its famous conclusion remains one of the most surprising, and well-achieved of any in the genre. The play is unusual among Shakespeare’s works in that its simple story seems to be original to him. The prose narratives that sparked Twelfth Night, As You Like It and Measure for Measure, or the great classical poems that Shakespeare plundered for Troilus & Cressida and Titus Andronicus are absent here. The inspiration for the play is to be found more in the verse fashions of the day – chiefly, perhaps, in the love poetry of the diplomat and soldier, Sir Philip Sidney, whose influence on his Elizabethan contemporaries was profound and lasting. The four young gallants of the play show themselves more than competent in his art; it is their questionable competence in life that their facile poetic gifts throw into relief. Contemporary history may also have been an influence. In 1589, the Protestant Henry of Navarre, who in 1572 had married Marguerite de Valois, sister to Henry III of France, succeeded to the French throne and later converted to Catholicism. Navarre – which had lost its southern part to Spain three quarters of a century before – thus became subsumed into modern France. The parallels between these events and Shakespeare’s story of a King of Navarre and a Princess of France are slight, but he may well have intended them to add a frisson of power politics to a plot that is otherwise conducted in a relaxed, holiday mood.